This Javanese favorite is one of the most widely known regional dishes of Indonesia. 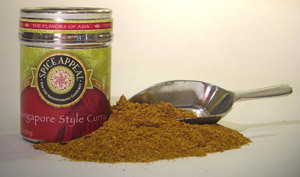 This tasty blend contains turmeric, sugar, coriander, lemongrass, cayenne, and other spices. Mix 2 tsp with 2 Tbsp of coconut to marinate cubes of meat, fish, or poultry that are then threaded on skewers and grilled or broiled. Serve with a spicy peanut sauce. Makes a wonderful appetizer or snack food for any occasion.